I’ve been working in publishing in one capacity or another for over a decade, and in that time I’ve read more than my fair share of “slush”—unsolicited manuscripts submitted by writers to publishers, literary agents, and journals and magazines. Many of these writers are just starting out, and over the years I’ve come to realize that most writers in the early stages of their learning process make the same mistakes over and over again. Today, we’ll look at some common pitfalls to watch out for. I can tell you from experience—there’s no faster way to send an agent scurrying for the form rejection than an italicized prologue. While there may be rare occasions where this device works, it’s such an oft-abused opener that it’s far more likely to make your reader think you don’t know what you’re doing. Harsh? Maybe. True? Yes. Ask yourself what function the prologue is performing in your story—odds are, the answer is “none.” You might think you’re setting the stage with a little mystery to draw the reader in, but a killer first line and opening scene is a much more effective way to grab your reader’s attention. Ditto for starting with a dream. Beginning with a dream is so over-used that it may turn your reader off even if you’ve managed to make it work. Nothing keeps a plot snappy like a great villain or a compelling heroine, but remember—real people are complicated, even the nasty ones! Maybe the evil Dr. Claw daydreams about a different career, or the noble romantic lead harbors secret thoughts of embezzling from his employer. Nobody is all good or all bad, and the same should be true for your characters. Keep an eye on things like verb tenses, character names, setting, time—anything that should be consistent throughout your book or story. Is your narrator hanging out in the present tense in one sentence, only to slip into the past tense in another? Does your scene start out in the early morning and jump abruptly to a moonlit walk? Is your nefarious villain Dr. Claw on one page and Mr. Claw on the next? The more you can eliminate these kinds of errors, the more your reader can focus on the story. Working exposition into your story without overloading the reader is one of the trickiest skills for a writer to learn—and it’s not just beginners who have trouble with this one. You want to keep the pace moving and the story rolling forward, especially in the opening pages. Try to break up your backstory as much as possible, and avoid obvious tactics like giving one character an unwieldy monologue explaining, say, Dr. Claw’s entire life history. As you’re writing, ask yourself if the backstory feels organic. Have you reached a natural place in the plot to take a little time-out and clue the reader in? If a character is explaining something, does the dialogue fit in with the story? Infohoarding is the opposite problem—refusing to let your reader know what’s going on in the hopes of piquing the reader’s interest. While this can work well in moderation—one classic example is Arthur Conan Doyle’s Sherlock Holmes stories, where Holmes solves the mystery long before the reader does—holding back too much information can leave your reader frustrated and confused, rather than intrigued. Be sparing with words like chortled, guffawed, shouted, snapped, muttered, whispered, etc. Bombarding the reader with dialogue tags is another indicator of amateur writing. Use “said,” and let your reader figure out the speaker’s tone from the context of the dialogue. Tagging falls under that age-old adage of telling, not showing. Your reader should be able to understand your character’s emotions from his or her actions or the context of the scene. “When you catch an adjective, kill it,” Mark Twain said, and the same is true for adverbs. Adverbs, like dialogue tags, are indicators of lazy writing—use them at your peril! Do a manuscript search for “ly,” and be ruthless with the delete key (if it makes you feel any better, when I do this with my first drafts they light up like a Christmas tree). Adverbs almost always state the obvious—“slammed the door angrily” (can you slam a door happily? ); “wept sadly” (as opposed to euphorically? ); hissed menacingly (unlike that other, friendly kind of hissing). 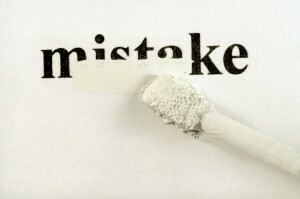 Don’t be discouraged if you find yourself making some or even all of these mistakes at first. Writing is a craft, and if you’re passionate about it you will likely spend the rest of your life perfecting it. Next time you look over your draft, keep these common errors in mind and you’ll be on your way to a more polished, professional manuscript.